Brooklyn, NY — Several officers attempting to make an arrest at the wrong house quickly turned their incompetence into a deadly situation. As police were trying to force their way into the wrong home, they irresponsibly let the home owner’s dog loose. When the dog ran out, he was naturally in an excited state. The dog jumped on a frightened lieutenant but didn’t cause any harm. Then one NYPD officer, with absolutely no regard for his surroundings pulled out his service weapon and fired his gun at point blank range. As the incident unfolded, a crowd had gathered, some of the people in the crowd had their cameras rolling. One video captured this reckless shooting first hand, from only several feet away. 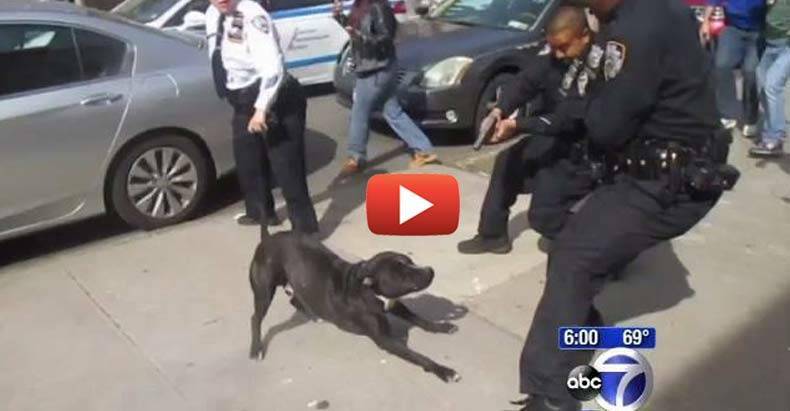 Luckily for this dog, this officer was a horrid shot. Also lucky were the people in the crowd who managed to avoid being hit by any of the bullet fragments as they ricocheted off the concrete. “No, no you wrong. You wrong. You’re dead *expletive* wrong for that,” a person in the crowd yelled after the officer shot. “Are you serious? There are kids out here,” another witness said. “You’re at the wrong house,” another person yelled. The name of the officer who endangered the lives of all around him has not been released and it’s unclear whether or not he will face any discipline. According to WABC, police acknowledged they tried to make the arrest at the wrong home. In the land of the free, police can come onto your private property, gun your tiny dog down in broad daylight, and this is called ‘standard procedure.’ Well, it’s a damn good thing that postal workers, delivery truck drivers, pizza delivery drivers — and all the other jobs that require people to go to someone’s home and NOT KILL THEIR DOG — don’t claim the same rights as cops, or family pets would probably be extinct. Sadly, this trend shows no signs of slowing. The Puppycide Database Project estimates the number of dogs being killed by police to be upwards of 500 dogs a day (which translates to 182,000 dogs a year). Because not all police departments keep track of canine shootings, these numbers vary widely. However, whatever the final body count, what we’re dealing with is an epidemic of vast proportions. Incredibly, in 1 out of 5 cases involving police shooting a family pet, a child was either in the police line of fire or in the immediate area of a shooting. The so-called “dangerous” breeds of dogs aren’t the only ones that are being killed in encounters with police either as this case and the one’s below illustrate. To those that think cops killing dogs is not a problem, we encourage you to watch the video below and then take a look through our puppycide archives here.